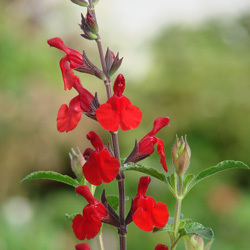 (Radio Red Autumn Sage) Dark calyxes support true red blossoms in Salvia greggii 'Radio Red', a 2015 introduction from the Darwin Perennials division of Ball Seed. Its tiny, smooth, elliptical leaves form a light, airy backdrop for the dramatic flowers. Well branched, short, compact and long blooming, Radio Red Autumn Sage is an excellent choice for containers or front of border. 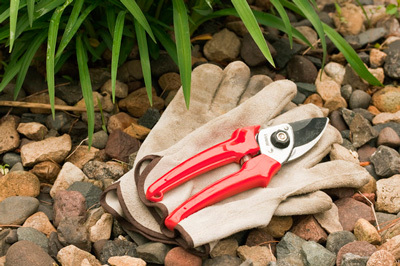 Although adaptable to many kinds of gardens, this cultivar prefers average watering based on local rainfall. Radio Red grows well in full sun, but can handle partial shade for part of the day. 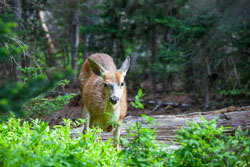 Deer avoid it, but honeybees and hummingbirds enjoy the nectar and pollen of this vigorous, cold-tolerant perennial. Western pioneer and plant explorer Josiah Gregg introduced Autumn Sage to horticulture in 1846. He collected it in the Southwest while working as a scout and Spanish interpreter for the U.S. Army during the Mexican-American War. Although first cultivated in 1885 and a long-time staple in Texas gardens, Salvia greggii didn't show up in plant nurseries until about 100 years later. Now it is one of the most popular species of Salvia for home gardens. Some Salvia collectors want to obtain a broad range of sages including all the new introductions on the market. But Flowers by the Sea can't and doesn't want to grow all the new cultivars available, partly because there is a growing abundance of Salvia introductions. Instead, FBTS focuses on selecting the most superior new plants even when introducing its own hybrids in its series of Rainbow Jame Sages. 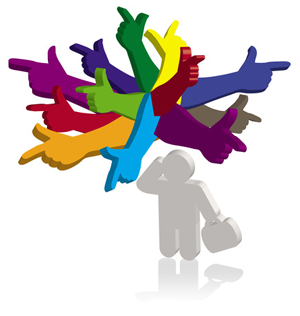 Ask Mr. Sage is a regular feature based on calls and emails received by FBTS. I've planted and have salvia in my garden. I prefer salvia grown in a large pot, they are beautiful, easy to maintain. I like to keep a consistent dead head going with this plant. I cut this plant back for the winter. 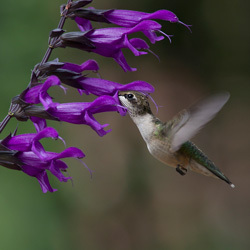 The humming birds love red salvia, I so enjoy watching them feed and flutter about the garden. One spring day, some year, I hope to plant a grouping of red salvia plants in a garden. Yes red salvia is my go to plant for the spring into fall. I'm thrilled FBTS offered this Salvia this year! Thanks Kermit! Bright red flowers that gets attention. Never can have too many red Salvias for the Humingbirds! Wished I'd gotten a couple more Radio Red this year. Even though it is hardy for me, I decided to plant it into a container. It is at a height that I can see it and enjoy the flowers better. Another healthy plant from FBTS. All I can say is WOW! The color on this is amazing! The red is a deep cool tone red that just pops next to the blue green foliage. I have it next to my ultra violet, and it is just gorgeous together! The hummingbirds like it too. Beautiful size & color but not great performer for me. So excited w saw this smaller version Salvia greggii, bought 5 for April 2107. Same H2O & feeding routine that all my plants get. 1st hummer 2 arrive w drawn 2 beautiful neon red flowers that really "pop". N July/Aug. really began 2 struggle even though watered during any dry spells- lost 3 plants. Our backyard can get to 110 degrees. Thought plants that got a little shade w do better but lost 2 n part sun/shade & 1 n full sun. Don't know how the 2 left will fair during winter. Thinking of trying 1 plant n container 2 c if does better 4 me as loved size & color. Hummers loved it 2. Plants never bloomed 4 me like larger S.greggii that I had n pots & n ground. Didn't act same as larger Only worked 4 me as Spring plant only. Denton, Tx with brutal Summers. I loved the deep, vibrant red of these autumn sages so much that I want to plant them again as annuals. (Red Velvet Mountain Sage) This is one of the most intense red-flowering variety of Mountain Sage we grow. Medium-sized flowers are profuse on this large, vigorous plant -- particularly in spring and fall. Dark stems and calyxes intensify the plant's drama along with glossy green foliage. 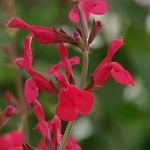 (Furman's Red Autumn Sage) Selected by noted Texas plantsman W.A. Furman in the 1970s, this hardy Texas native is beautiful and tough withstanding heat, drought and freezing winters. Its flowers, which bloom spring through fall, are a rich, saturated red bordering on magenta. (Karwinski's Sage) From moist mountain areas in Mexico and Central America, this rugged, winter-blooming shrub is found in oak or pine forests at altitudes of 4,000 to 8,000 feet. This may account for this winter bloomer's ability to produce some bright, brick-red flowers even during short periods of freezing weather with temperatures as low as 20 degrees F.
(Windwalker® Royal Red Salvia) Salvia darcyi x S. microphylla 'PWIN03S' is one of the top 2015 plants for USDA Cold Hardiness Zone 5 selected by Colorado's Plant Select®, a nonprofit organization that focuses on promoting plants for low-water gardens. (Elk Crimson King Jame Sage) Sometimes words fail us when trying to describe a unique new color. Definitely red, but with a clear blue overlay and a blue eye. Featuring masses of flowers that delight pollinators, this FBTS introduction is new for 2017. (Cherry Chief Autumn Sage) With hundreds of varieties of Autumn Sage on the market, there is much confusion as to which ones to plant.Â This red-flowered cultivar, developed by Richard Dufresne of North Carolina, is a top choice. (John Whittlesey Sage) Hardy, vigorous and long blooming, John Whittlesey Sage is a hybrid of D'Arcy's Sage (Salvia darcyi) -- a native of Mexico -- and Mountain Sage (S. microphylla), which is native to the American Southwest and Mexico. (Arctic Blaze® Purple Sage) Bred to be a strong grower while remaining hardy, this new hybrid Sage has some of the best characteristics of both of it's famous parents. Pollen from Salvia microphylla 'San Carlos Festival' was used on flowers of Salvia lycioides x greggii 'Ultra Violet' and one of the resultant seedlings became Arctic Blaze Purple. (Lipstick Autumn Sage) Similar to a little bit of lipstick on a pretty face, the rosy flowers of this hardy, heat-tolerant sage add a finishing touch to a perennial Salvia border. The creamy pinkish-red blossoms have a contrasting white throat and are cupped by rosy brown calexes on long spikes. (Flame Autumn Sage) Crimson flowers contrast brightly against deep purple calyxes and stems in Flame Autumn Sage. The leaves -- tiny ellipses without veins -- are soft and shiver in the breeze. (Diane's Autumn Sage) Chip Schumacher of Hill Country Gardens in Texas selected this lovely Autumn Sage hybrid, which has handsome foliage and abundant two-tone dark purple flowers. This fine variety is often the first Salvia greggii to bloom in spring. What beautiful, tenderly cared for plants, and so carefully packed. I've never seen anything quite like it. Your love for your plants is contagious. Now I love them too. Thank you. I just had to tell you how nice these plants are. Your nursery is a rare find! Plants were large and healthy! I'll be ordering from them again.